The world (especially the food industry) wants you to believe that you are too busy and you don’t have time to cook a meal. Only then, they can sell solutions that promise to save you time. I have written enough about processed foods and junk foods. But there’s also another industry that’s growing in urban India - food storage products. The demand for ziplock bags, aluminium foils, cling wrap, freezer trays, freezer safe plastic containers and MW reheatable boxes have gone up so high in the past decade or so. Many families buy a microwave oven SOLELY for the purpose of reheating food. I don’t cook with the intention of making extra portions for subsequent meals/days. On most of the days, there are hardly any left-overs in my home, given that I know the exact quantity to cook for my small 3-person family. In rare cases, if there are left-overs, we use it for the next meal (usually for dinner). We usually get vegetables from the super-market/grocery stores, who procure them from a wholesale supplier. The vegetables we buy are already a few days older from the time they have been harvested from the farm. 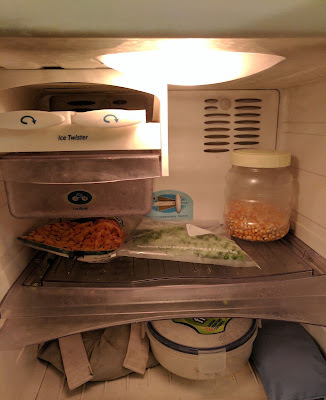 Many of us in the cities buy vegetables for a week and store them in fridge (I do that too). Some of the nutrients are already lost in this time period. There will be hardly any nutrients left if we chop them all and freeze for a week. I recently came across a blog post by a nutrition specialist who was recommending making salads in bulk and freezing for a week. Seriously? What’s the point of eating salads then? If we freeze and eat them, I wonder what vitamins and minerals are left in those vegetables. The more time your food remains frozen, the higher the amount of nutrients get degraded. Also, the right temperature to thaw the food evenly is required. If there are frequent power cuts, the temperature fluctuates, thereby resulting in food spoilage. Temperature varies in the freezer, depending on how many times you open/close the door and whether you keep your food in the door shelf or in the deep freezer. Storing/reheating cooked food in plastic containers is a strict NO-NO in my home. Even if the plastic is food-grade, doesn’t contain BPA or belongs to Tupperware, I never use plastic in MW. On rare occasions, when I want to reheat rice, I take it in a ceramic plate / bowl. "மூத்த நாள் சமைத்த கறி அமுதெனினும் உண்ணோம்"
which roughly translates to "don't eat food that was cooked yesterday, even if it is amirtha (nectar)"
Now that I have set the context, let me share with you 9 tips to make fresh, healthy, home-cooked meals and at the same time, you don’t end up slogging the whole day in the kitchen. Let me admit that I’m a slow cook. I have seen people who move faster than me and can chop vegetables quickly like a pro. Having said that, I’m slow but an efficient cook in my kitchen. I have a 3-burner gas stove and I ensure I use 2-3 burners at the same time. Multi-tasking helps me to finish work faster. I spend around an hour in the morning, preparing breakfast and lunch. And around 30-40 minutes in the evening, preparing dinner. A typical morning would be like - boil water in the kettle, soak dal for sambhar with the hot water. While the dal soaks, chop vegetables. Pressure cook dal in one burner, boil milk in the second, prepare dry veg sabzi in the third burner. Once dal is cooked, keep another pressure cooker for rice. Make tea in the second and so on. You get the drift? Practice puts you into auto-pilot and you can get things done faster. I remember the early days when I started to cook. I used to wait for the milk to boil before I start heating the water for tea. Only after tea is done, I would start my breakfast work slowly. Reminds me of the sloth character from Zootopia ;-) Now I’m glad that I have learnt to optimise my time. I spend around an hour in the morning, preparing breakfast and lunch, making tea and packing lunch boxes. My kitchen work gets over before 10AM, after which I don’t need to step into the kitchen until evening. 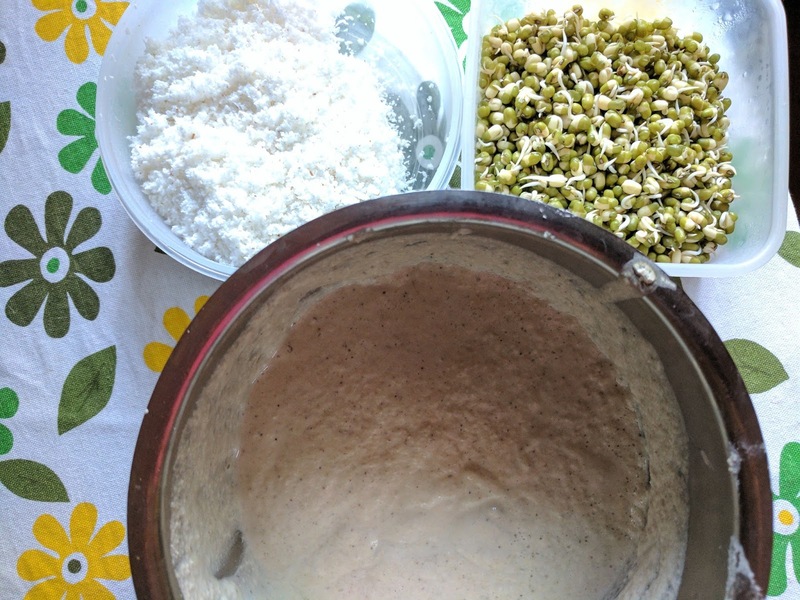 When I make my cup of evening chai, I plan my dinner and start prep work like rolling chapathi dough, boiling lentils etc. While I make dinner in the night, I boil milk to set curd for the next day, soak lentils like chickpeas, rajma etc. I tried weekly meal planning but I find that to be a tedious process. I prefer to cook spontaneously based on what captures my interest in a given day. At the same time, too much spontaneity can be confusing. Every night, before I go to bed, I make a mental note of what to cook for next day’s breakfast and lunch. That way, when I wake up, I can get into auto-pilot mode and start cooking right away. I had written a separate post on this technique couple of years back. It has become a habit and it helps me to ensure I use up all the vegetables stocked up, without any wastage. One quick look at this list helps me to plan my next day’s menu easily. Do check out the detailed post. For a small family (2 adults + 1 little girl), this works just fine for us. We would rather eat freshly made dosas with chutney podi than eat a 4-day old sambhar and a 3-day old curry. Getting up in the morning and seeing a clean kitchen counter top gives a positive feeling. After dinner, I ensure that I wipe the counter and put things back in their place. It takes me just 10 minutes and the mornings start off on a good note. I’m a stickler for this and I don’t like things being misplaced in my kitchen. All my grocery supplies are in labeled, transparent containers. When I cook, I don’t spend any time searching for an item. The weekend habit of filling the containers and taking stock of groceries help a great deal in managing my time in the kitchen. There will be times when spending 1.5 hours in the kitchen on a daily basis may not be feasible. During such times, it is better to employ a cook and get fresh food everyday on the table. There were times when I had a cook at home - when my daughter was an infant, when I was working for a startup full time, when I had guests at home for long duration etc. There has been an increased awareness on the importance of fitness in the last 5 years. Many of us are diligent in our morning workouts and invest an hour everyday towards fitness. Let’s try to give the same importance to our nutrition as well. Time in the kitchen is not an expense. It is an investment towards better health for you and your family. Let’s not fall into the trap of frozen foods and quick solutions. Treat our bodies like a temple and feed with love, care and fresh food. Hi Anuradha Madam.iam a big follower to u r posts.u r ideas regarding healthy food preparations are too Gud and very helpful to so many people like me.cooking is done by everyone but now a days cooking healthy food is very important this is the speciallity of yours.millet dosa/idly preparations& different podi items ideas especially placing millets into our daily cooking habit is very cool idea special thanks to u for dis. First time i red u r blog " 10 habits to keep pcod under control" it is very very useful for me and that page I copied into my phone & sent to many of my friends who are not aware of pcod problem and feeling depressed for pcod issue.your post was very helpful to so many of us.and I want to share u one thing by following strict diet and by eating healthy food and excercises now am carriying.keep posts and blogs like dis only.Thank u madam..
Love love love your blog post! I finally found someone who's ideas reflect mine, but you sure know a better way to put them into words! People think I'm obsessed with cooking everyday and eating clean. I never thought about it until I read your post how important it is to keep the kitchen and counter top clean! You rock! �� We are going on a trip where we will be hiking for 3 days, and I don't have an option to cook there. As I hate eating out, for the first time in my life I bought ready to eat mix. I look at those boxes and it makes me cringe!